In July of 2014 our friend from Denmark, Torben Sondergaard from thelastreformation.com agreed to lead at a 4 day healing and discipleship training event I hosted here in NH and MA. Over 90 people attended from 13 states, and I believe the event was the start of a great revival for the church as the Bride of Christ prepares for His return. Since the event, we’ve seen an awesome awakening where several of us have been hitting the streets for almost 2 years now, watching God transform life after life. People are getting healed, delivered, and set free from pain, sickness, and spiritual death everywhere we go. Salvation and the good news of the gospel are being preached and many are coming to know God’s love and truth for the very first time. The simplicity of the full Gospel with fresh perspective on repentance, faith in Jesus, water baptism, and the infilling of the Holy Spirit are being renewed in the church. This truly has been a reformation for us personally and we really do look and feel more like the book of ACTS church more than ever before! Hallelujah!! This is the gospel of Jesus, this is the life of a believer, ever filled with power and wonder in the Holy Spirit. Because of these divine experiences, Laury and I have been receiving many requests for training people in healing, street ministry, and discipleship. Recently we were invited to do a conference for a Hispanic community in Texas to preach about manifesting the love of God, the teach about flowing in the spiritual gifts though the simple obedience of laying on hands and ministering in the streets. We were able to preach four different messages to several different groups of people growing in faith, and provide hands on training to those interested. Everyone was excited to see results as we walked in the simplicity of faith, and love. One thing has become obvious as we’ve traveled and met many who are hungry for the manifestations of God’s love, through the gifts and who are hungry to see God bring salvation to the earth through His children; God is ready, willing and able to do a great work through His people, and He’s not holding anything back from us! If God is calling you and you are interested in getting Kickstarted, please fill out the form below and Laury and I will contact you as soon as we can! Incredible things have been happening. My amazing wife has been scheduling us for every public event she can find, and we’ve found a local food bank where we can pray for people every Thursday! I’m a little behind on our blog, but it’s at www.dwjd.us . (Do What Jesus Did). We’ve seen a man with no feeling in his arms due to a transformer accident regain feeling, a woman in an electric wheelchair get up and walk around her chair, pain go down from 10 (and sometimes 20!) to zero, sprained ankle with boot and crutches totally healed, and last week someone we prayed for in our house is now my sister in Christ! We have Activiated 7 other people, and someone is coming to us from PA this weekend. Our new friends Paul and Lynn drove 16 hours to be Acitivated – that’s a strong calling to drive so far! It was another awesome weekend of training on the streets, in the parks, in two feeding centers, and in a shopping mall. God sure honored their hunger to serve Him in a mighty way! Jesus showed Himself strong everywhere we went we shared healing and the Gospel! Check out a couple of the videos. Man’s Knee Pain Healed During Training! Our new friends Steve and Daisy came all the way from Yonkers NY for us to train them in healing the sick and preaching the Gospel on the streets (we call it Kickstart Training). 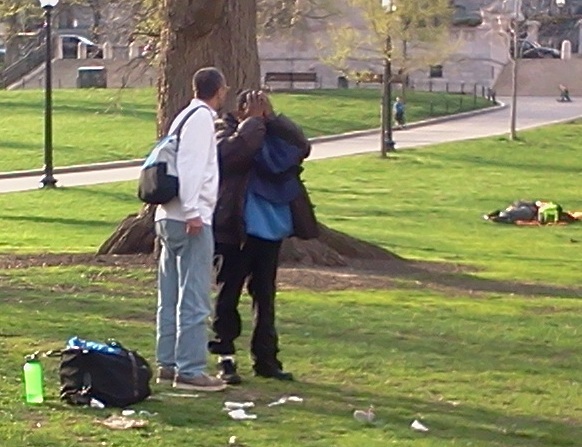 It was the first time they had ever seen Jesus using them for healing like this, and after seeing Jesus use them to heal about a dozen people earlier in the day, this was one of their encounters later in the afternoon in a Manchester NH park! It was an awesome training day. Yay Jesus… He is the same yesterday, today, and forever! Scott & Laury Levesque will be doing a Kickstart training at the church to show how simple it is to lay hands on the sick and see consistent results. These are some recent testimonies with Scott & Laury on the streets: Man Healed and Walks Without Crutches in Lowell- then receives Jesus! Hearing Restored: 3 Remove Hearing Aids in NH! Man Healed and Walks Without Crutches in Lowell- then receives Jesus! 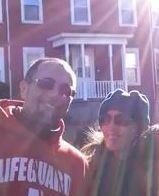 Check out how the Spirit of God is being poured out in NH in three days 12/13 to 12/15. This is the normal Christian life if we will just believe! At the feeding center Saturday we prayed for Women with back/sciatic pain and with a tumor on her back-all pain left and after three prayers the tumor disappeared. Then she received Jesus as Lord and we asked for the baptism of the Holy Spirit, ….she got hosed and she said she felt happy. Two women in anguish got prayed for and wept after being touched by the love of God . They got filled with the peace of Jesus. Another mans pain went down to zero in his knees after prayer and he had far greater movement afterwards. So many people have been healed at the feeding center these past 5 weeks that each week we see less and less sick people to pray for (yay! )….they are all getting healed in the name of Jesus. One day, I know we’ll be hitting hospitals in every city and doing the same! Later at lunch I got a word that a 55 year old man’s knee was in pain from a sports injury after High School – He was a bit freaked out that we knew that and only let us briefly pray once, but he felt relief! Later in Walmart we saw a woman’s foot completely healed, four different women with various back pain/sciatic issues healed, three women with hip pain healed, three women with canes and knee pain healed, one man with hip and knee pain healed, I got a word of knowledge about arthritis with a sweet older women in her back – two prayers and she went from a pain level of 8 to zero and was healed, a women in a scooter with polio felt all the pain leave her back and legs after three prayers, and a sweet 92 year old women who had stomach pain got healed and was so moved that she wept and and praised God for healing her and thanked us several times with great joy in her face (she got hit hard by the presence of God). It was precious and beautiful! On Sunday we prayed for a man with a bad knee at a local church and his knee got healed. Then at mom’s nursing home we prayed for an ankle injury on a kitchen worker who got healed, and then we prayed for a 92 Y/O women (patient) with a broken tailbone who’s pain went to zero- she also had arthritis in her hands with pain unable to move them. All pain left after 3-4 prayers and she had total movement and said they felt very hot! Jesus! Amazingly we’ve been praying for a chance to raise the dead and the night ended with God giving us a chance to pray to raise someone who died while at the nursing home while we were still there. We had faith she would rise and layed hands on her since she was in the bed beside mom’s, but I believe she was already in heaven and wouldn’t come back (hey I can’t blame her! )…I believe we’ll see the dead raised here soon enough because Jesus said so….next one! Then, last night at mom’s nursing home a nurses attendant got healed of oppressive fatigue, and calf cramps and then an LNA got healed of sciatic pain and hip degenerative pain. We are starting to see more and more staff members (and patients) healed at the nursing home! Jesus is alive and well in NH! …all creation anxiously awaited for what is being revealed today – Just Believe! This is a video of a typical healing in Walmart (three weeks ago)!